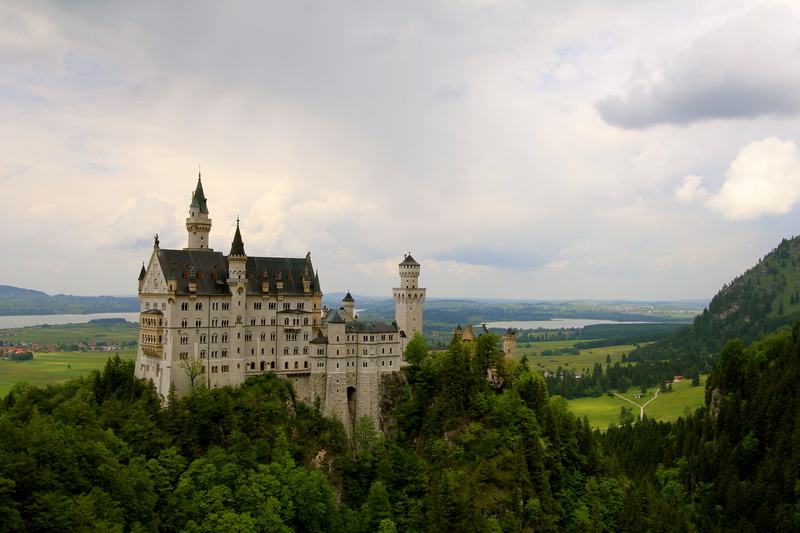 Germany has literally hundreds of castles, but the Hohenschwangau and especially the Neuschwanstein Castles are completely “fariytale” type castles. 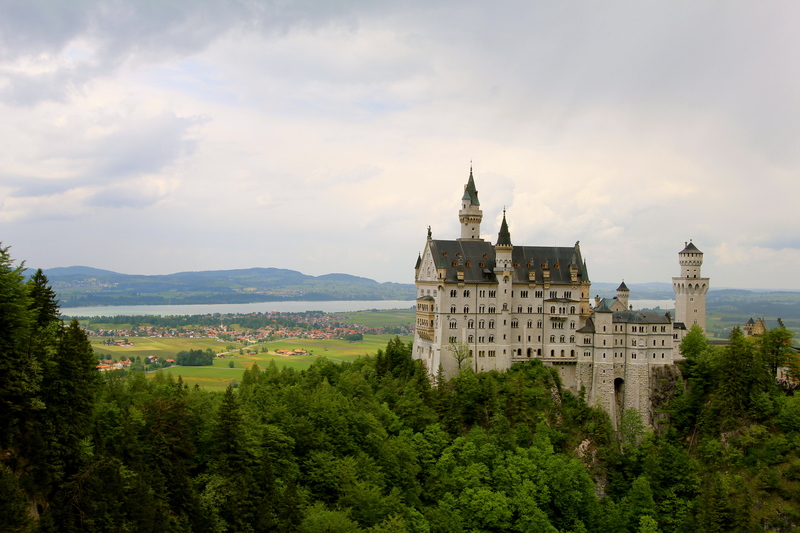 So much so, that the Neuschwanstein Castle was used as the model for Sleeping Beauty’s castle in Disneyland (the iconic image of Disney)….but, this isn’t a theme park…it is the real thing….my parents and sister really enjoyed our day here, and the weather was perfect! Located at the southern-most region of Germany along the Austrian border sits the two castles Hohenschwangau and Neuschwanstein. 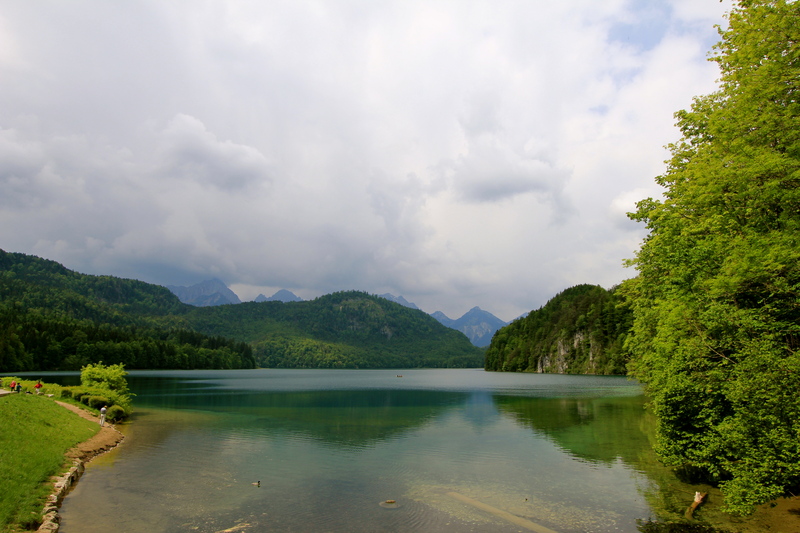 We stayed the night in Ulm, Germany so it was only about a 90 minute drive south (or about 2 hours southwest of Munich), and the drive concludes along a 15 minute winding road off the A7 Autobahn. The castles are located in the German state of Bavaria, and sits on the border between Germany and Austria in the foothills of the Alps. Alpsee Lake just below both castles which are behind us. The small towns between the castles and the A7 offer accommodations and restaurants surrounded by lots of hiking and biking trails. We did not stay overnight here, as our final destination for this driving trip was Venice, Italy. So, after our four hour visit here, we still had another 90 minute drive to Innsbruck, Austria, where we planned to stay the night. 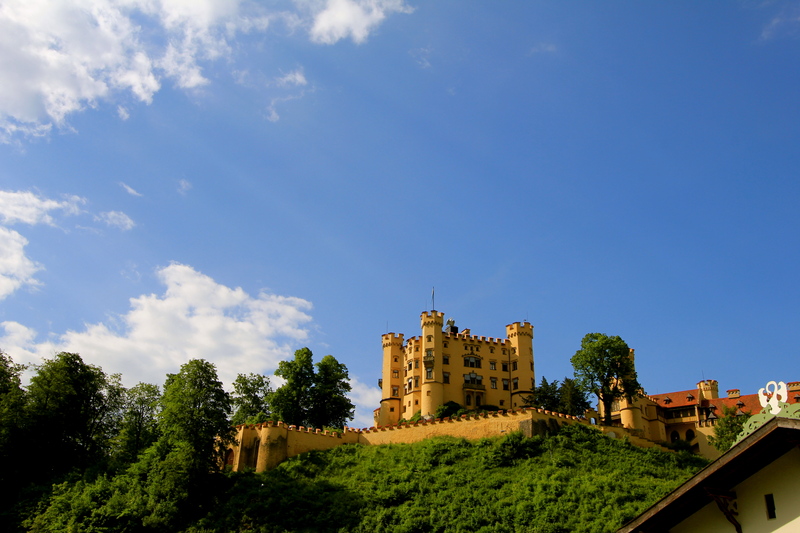 The first castle you see upon arriving is the Hohenschwangau (Ho-hen-schwan-gow) Castle. The original castle was built by Knights in the 12th Century, but fell in ruin. In 1829, the King of Bavaria (Maximilian II) acquired the ruins of the original castle and built this one seen above the hill top. 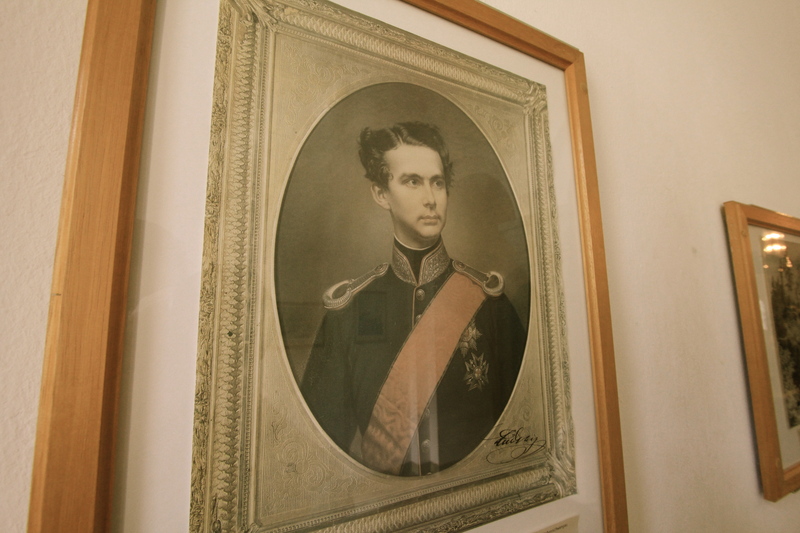 The future King of Bavaria Ludwig II lived here with his father Maximilian, as this was their summer home. For such an isolated location, these castles are one of the top tourist destinations in Germany today. 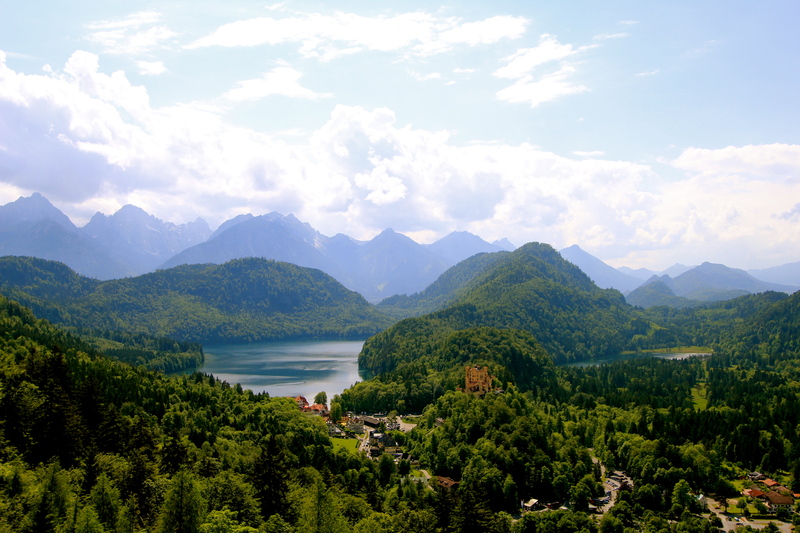 As a child, Ludwig II would look across the valley at the neighboring mountain top and dream about building his ultimate castle. At the top of the hill in the distance, this is the castle that King Ludwig II had built. The name of the castle is Neuschwanstein (Neu-schwan-stein). To get to the top, we took a bus that traveled up a very winding (switchback) road just below the castle. 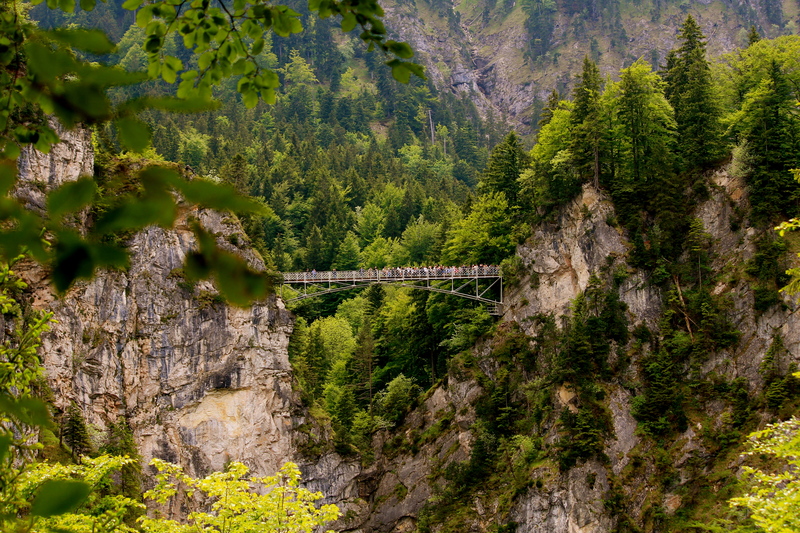 From the bus stop, you walk 5 minutes up hill to “Marie’s Bridge” (named after Ludwig’s mother). Once walking out onto the bridge, you get this SPECTACULAR view of the castle and the flat valley floor behind it. It simply does not look real in person!! 300 workers a day built the castle over a 20 year span that was one of the most expensive construction projects at the time (1885 it was completed). As castles in Europe go, this is fairly young (120 years old). 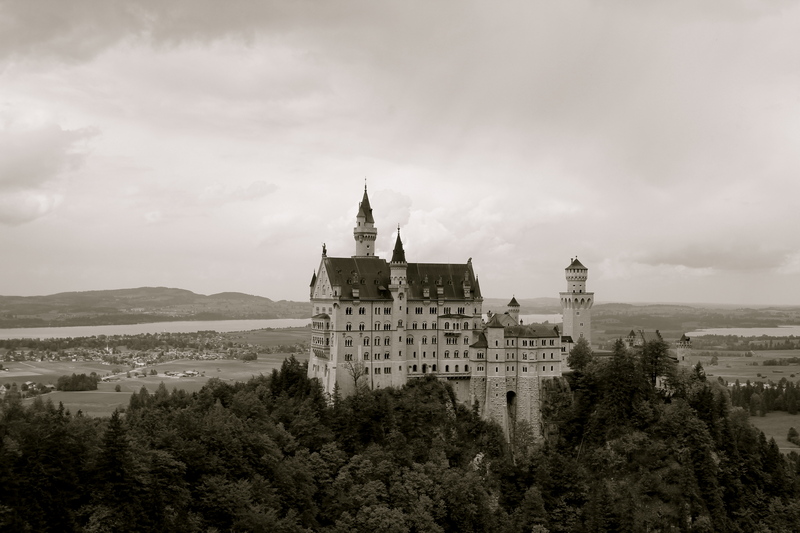 The King only lived in the castle 172 days before he was found dead in Munich. Theories about his death are that people were upset at the high construction cost, that he was unfit to be King because of mental issues? 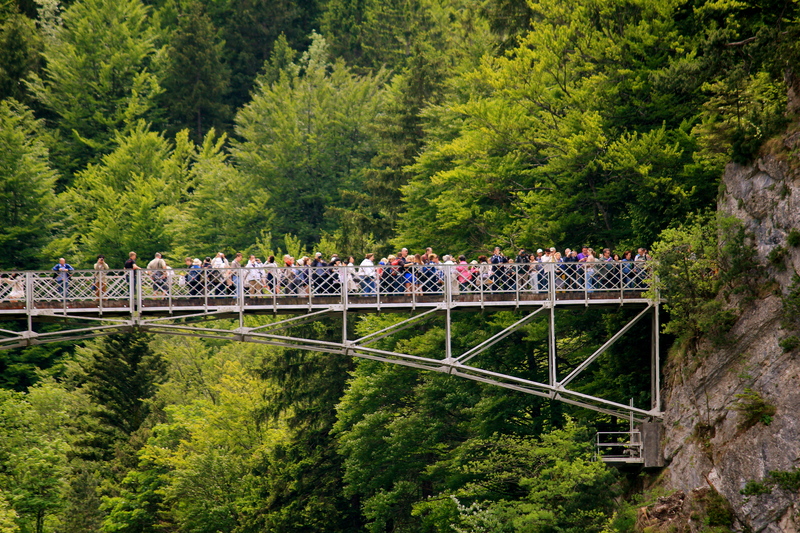 The following pictures is the view from Neuschwanstein of Marie’s Bridge….as an engineer, I know the bridge is safe….but seeing all of these people….wow! We were not allowed to take pictures inside. The inside of the castle is just as extravagant as the exterior. Ludwig loved Richard Wagner operas, and many rooms inside are decorated in themes from these opera, including an actual interior grotto (cave) from a scene from one of the operas. 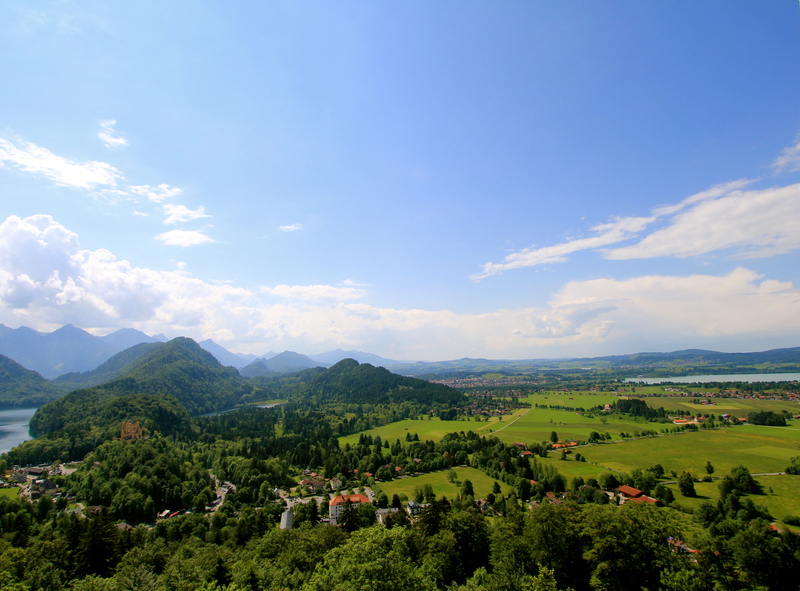 The view of the Hohenschwangua Castle and the valley from Neuschwanstein Castle. 1) Buying tour tickets from the site is okay, as the line moves along rather fast, and they accept cash or credit card in paying. There are plenty of signs above the ticket window to explain the different tours and the costs. When it is your turn to pay, go up to the window and the clerk is very helpful in answering questions I had. We purchased tours of both castles, and the clerk recommended the tour times based on the time I purchased the tickets, with the tours being in English. 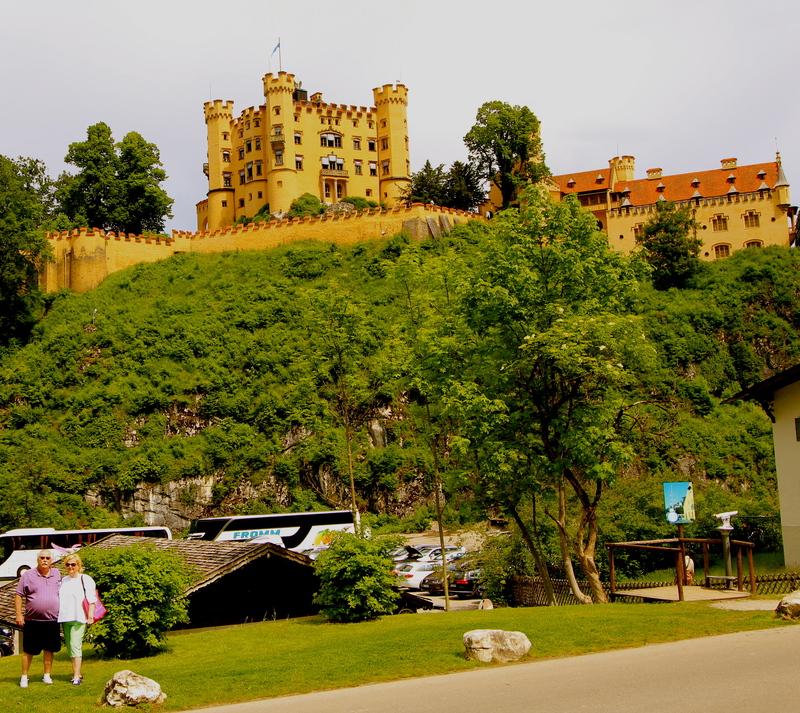 But, for us, since my parents had to walk a little slowly and we waited in a wrong line to see the Hohenschwangua Castle, we did not have enough time between castle tours. If you require extra time walking, then ask to have more time between tours. We had 2 hours between ours, and we really needed three. 2) Once buying the tour tickets, there are multiple options for getting up to the castles: horse carriage, walking, or by bus (to Neuschwanstein). There are maps showing the walking paths, horse carriage stops and bus stops, but pay careful attention to make sure you are in the right line. The horse carriage stop out front of the ticket building goes up to Hohenschwangua, which was to be our first tour. 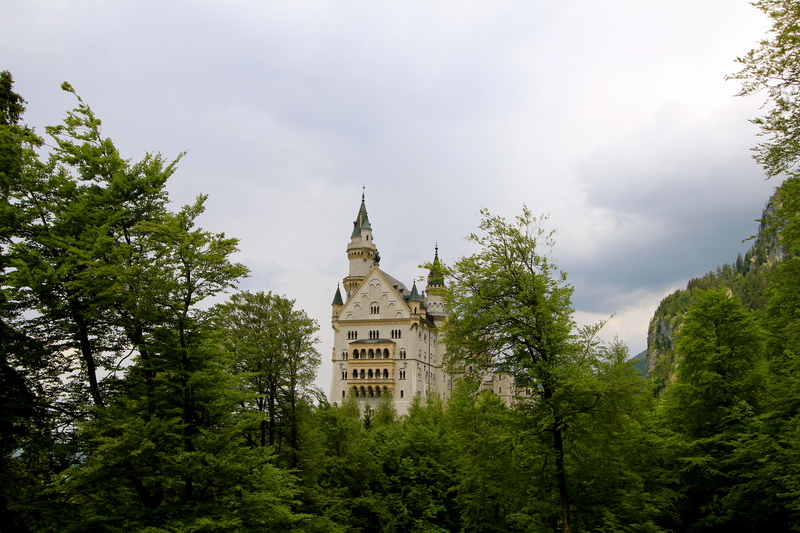 However, we stood in the wrong line for the carriage to Neuschwanstein, so we missed the tour of Hoehenschwangua. The horse carriage rides take a while (about 30 minutes). On a prior visit, I walked up to Hohenschwangua, which is not too bad. But, definitely take the bus up to Neuschwanstein. 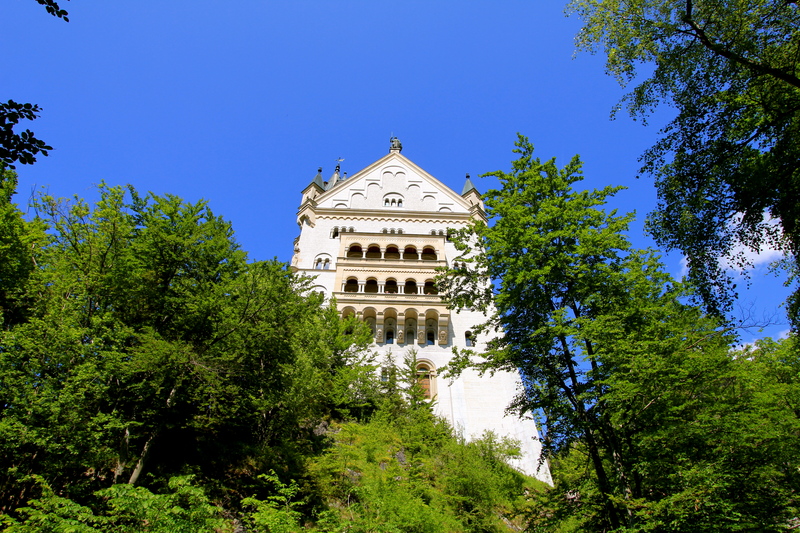 3) Buying tours: in hindsight, I would recommend just going up to Hohenschwangua and walk around the outside of the castle, and then take the tour inside of Neuschwanstein if time is an issue.